(1) Sub-plate mounting kit for 89-D type brackets and electrical boxes, includes mounting hardware. 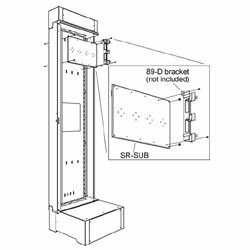 Optional sub-plate mounting kit allows for the mounting of up to (4) 89-D type brackets, (4) 1900 boxes or (1) Raco 3 gang box. Mount up to (4) SR-SUB's to each SR series backpan.